The Ouroboros is a Greek word meaning "tail devourer," and is one of the oldest mystical symbols in the world. It can be perceived as enveloping itself, where the past (the tail) appears to disappear but really moves into an inner domain or reality, vanishing from view but still existing. The ouroboros has several meanings interwoven into it. Foremost is the symbolism of the serpent biting, devouring, or eating its own tail. This symbolizes the cyclic Nature of the Universe: creation out of destruction, Life out of Death. The ouroboros eats its own tail to sustain its life, in an eternal cycle of renewal. It is sometimes depicted in a lemniscate shape (figure eight) as well. The Serpent biting its own tail is first seen as early as 1600 years BC in Egypt as a symbol of the sun, and represented the travels of the sun disk. From there it moved to the Phonecians and then to the Greeks, who gave it its name, Ouroboros, which means devouring its tail. In mythology, the Oroborus is a symbol representing the Milky Way galaxy. Myth refers to a serpent of light residing in the heavens. The Milky Way is this serpent, and viewed at galactic central point near Sagittarius, this serpent eats its own tail. Many ancients used the galaxy to calculate cosmic and earth cycles. It is found in Gnosticism and alchemy representing cyclical natural life and the fusion of opposites. It also symbolizes the transcendence of duality and was related to the solar God Abraxas, and signified eternity and the soul of the world. In alchemy, it represents the spirit of Mercury (the substance that permeates all matter), and symbolizes continuous renewal (a snake is often a symbol of resurrection, as it appears to be continually reborn as it sheds its skin. ), the cycle of life and death, and harmony of opposites. As a symbol of the eternal unity of all things, the cycle of birth and death from which the alchemist sought release and liberation. It unites opposites: the conscious and unconscious mind. 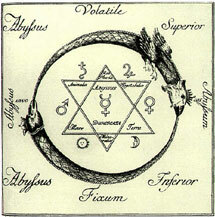 Alchemically, the ouroboros is also used as a purifying glyph. The alchemical textbook, Chrysopoeia (gold making) of Kleopatra contains a drawing of the ouroboros representing the serpent as half light and half dark, echoing symbols such as the Yin Yang, which illustrates the dual nature of all things, but more importantly, that these opposites are not in conflict. The book is mainly centered around the idea of "one is all," a concept that is related to hermetic wisdom. The Ouroboros appears in many other cultures and settings as well...the Serpent Jormungand of Norse legend, one of the three children of Loki and Angrboda, grew so large that it could encircle the world and grasp its tail in its teeth. It guarded the Tree of Life, and is often depicted as an ouroboros. The Aztec serpent God Queztacoatl was depicted similarly, and Chinese alchemical dragons have both similar shapes and meaning. In Hindu, you have the dragon circling the tortoise which supports the four elephants that carry the world.